If a book takes place in the great state of Colorado, I pretty much have to read it. It’s in the Constitution. Though the Supreme Court refuses to hear any cases about it. I want to read books that take place in other states, darn it! Regarding the story, all I’ll say is, Clyde Barr is living off the land as he makes his way north through the Rocky Mountains. He receives a call from his sister asking him to find her and rescue her because someone is going to do away with her. But the call is cut off and Barr is left clueless. That’s a pretty good setup for a thriller. As you know, I only review books I enjoyed on some level, so I obviously liked this one. It’s told in the first person, which I can’t write, but I like reading. I think the right characters are enhanced in first person and this is one of those times. Clyde Barr, while somewhat single-minded in this story (not that he has a lot of options anyway), has a detailed and meaningful backstory that the author wisely doles out in little pieces throughout the book. That backstory provides a lot of the depth for the events in the novel, which is needed because two pages in the inciting incident drops and the exposition is over. Boom! The story is off and running. The first-person perspective also helps crank up suspense in a thriller because neither the reader nor the main character know what the bad guys are doing until the protagonist encounters them. It lends to the feeling that the story could go absolutely anywhere. In this case, it feels like it could have. The events feel organic enough that I was kept guessing. That said, I would have liked the setting to play a larger part. The mountain towns of Colorado felt like simple set pieces. There isn’t a deeper sense of life in this part of the world that seems so important to the main character. Hopefully, the author is just saving up for future installments. On the other hand, the secondary characters are all well drawn, considering how quickly some of them come and go. A character named Zeke, who pops up later but plays a large role, is particularly interesting. The author must have had some kind of fun writing that guy (or the author has seen some sh!# and we should all be afraid). 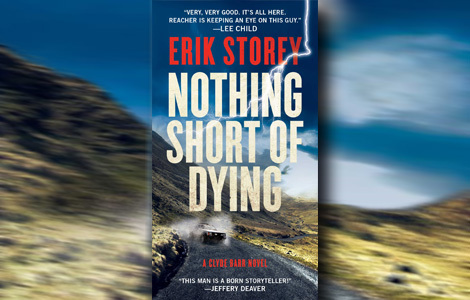 If you like thrillers with non-stop adventure from cover to cover, with three-dimensional characters whose motivations matter, I don’t see why you would pass this one up. Did I mention it takes place in Colorado?